Terakaft (“Caravan” in the Tamasheq language) is a four-piece desert rock band from northern Mali; this is their fourth studio album. They’re closely aligned with the more famous Tinariwen – guitarist-vocalist Liya Ag Ablil (aka Diara) was a member for 20 years, his two nephews flank him as singers, guitarists (electric and bass) and songwriters, and all three have performed on recent Tinariwen albums. Terakaft’s sound is also aligned with that of their more famous countrymen, although the smaller Terakaft tends to be more simple and direct. Some of Terakaft’s material is slow and introspective, but for my money where they really excel is on the more driving material like the four most highly recommended tracks. I do think that the best rock music in the world today is being made in the Sahara Desert – these bands have the energy, intensity and directness of communication that has made classic rock (everything from garage to punk to grunge) classic. 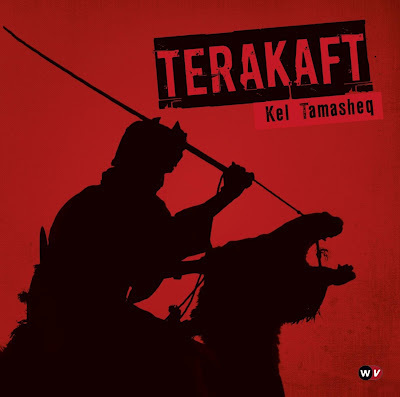 Terakaft is one of the best of these bands, and this album, simply and cleanly produced by Justin Adams (JuJu, Robert Plant’s Strange Sensations), shows them off to their best advantage. Excellent!